There is a whole world of essential oil information out there. Sifting through it can be overwhelming. 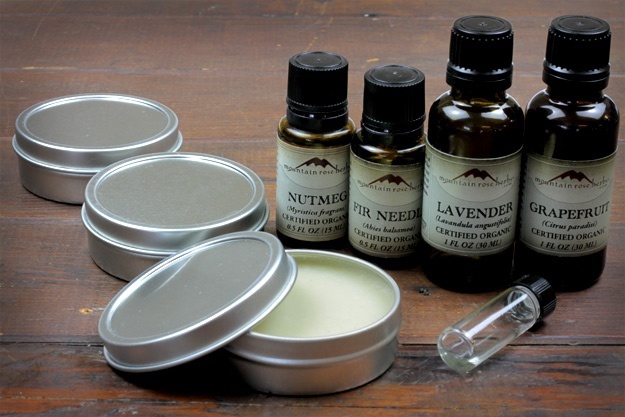 Here we cover the eight most frequestly asked questions and some of our favorite tips for using and storing essential oils. #1: What is an essential oil? First let's define what an essential oil is and how it's made. Essential oils are the volatile aromatic oils produced by plants. Imagine fresh lemon balm leaves warming in the sun, rubbing rosemary between the palms of your hands, or bringing lavender flowers to your nose for a deep inhalation. Plants create resins and oils to attract pollinators, warn predators, and to protect themselves against disease. The product you buy called "essential oil" is this aromatic substance concentrated through various methods. An essential oil is not an infused herbal oil. This is a very common misconception. Most plant aromatics can be captured through vaporization. Depending on the botanical, distillation can be done using only steam, utilizing water and steam, or by fully submerging the plant material in water. Here is an infographic outlining the distillation process. You will find that most essential oils are produced this way, including flowers, leaves, barks, and roots. Some oils, specifically citrus peel, are cold pressed to extract their aromatics. This process involves puncturing the skins of either the whole fruit or just the fruit peel and pressing the essential oil out. With this process, a little bit of juice is extracted, which is then separated from the oil. You can find distilled citrus peel oils on the market. However, these are mainly used in the fragrance industry and not appropriate for aromatherapeutic use. Some plant aromatics are too delicate for distillation or too bound up in resin, so a solvent is used to make an extraction. The solvents used can be a range of substances (non-toxic and toxic) including hexane, alcohol, acetone, propane, and others, so look for a supplier that lists the solvent type used. That puts the power in your hands to decide if it's the right ingredient for your needs. In a good quality absolute, the solvent should be completely evaporated out of the finished product. However, because of the possibility of trace amounts of solvent, absolutes are not recommended for aromatherapeutic purposes, but are great for perfumery projects and are alcohol soluble. 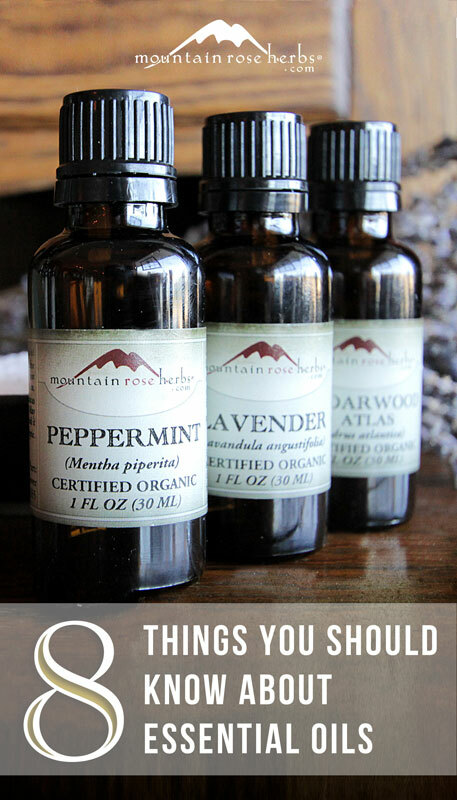 #2: How can I find high quality essential oils? First, you want to be sure that the essential oils are pure aromatic plant oils without diluents. Some essential oils on the market are cut with a carrier or diluted with lesser quality products. Next, to be certain that you are purchasing the right ingredient, look for the botanical Latin name on the product label. For example, Peppermint (Mentha piperita), should be listed clearly. 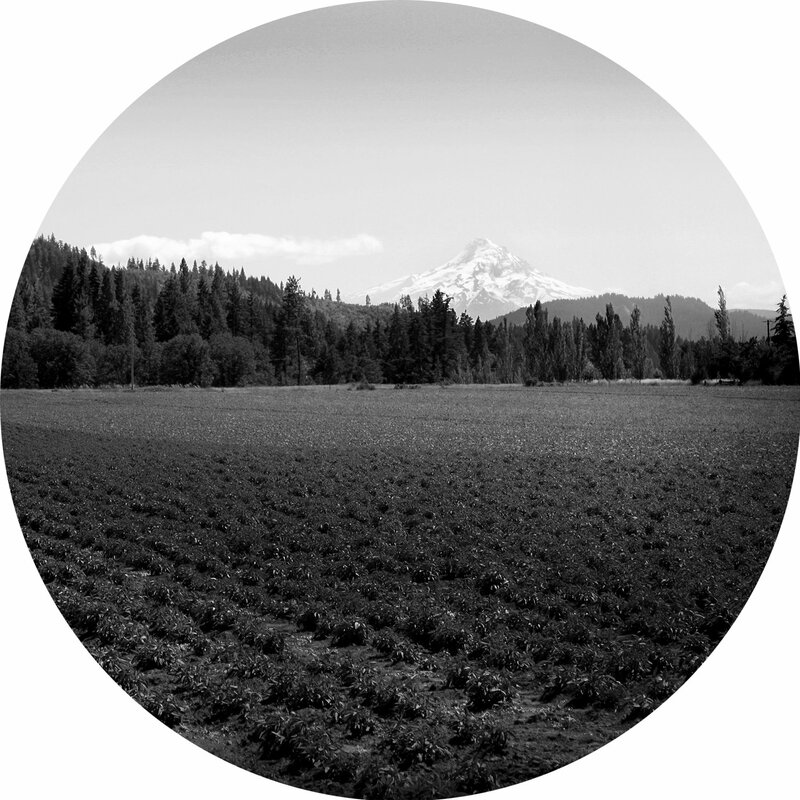 Purchase oils that are certified organic or sourced from a supplier you trust. Because essential oils are so concentrated, that means that pesticides and other toxins can be concentrated in the oil as well. Keep in mind that some essential oils are made from wild-harvested plants or plants cultivated without chemicals, so they may lack the organic certification. Avoid buying anything with the term “Fragrance Oil” as these are often synthetically produced and are not true botanical essential oils. #3: What about Therapeutic Grade? When first starting out, many beginning aromatherapy enthusiasts look for oils that are Therapeutic Grade. This distinction, however, is not an industry standard and is not endorsed or regulated by any governing agency. It is purely a marketing claim. You can learn more about this issue by visiting: AromaWeb and National Association for Holistic Aromatherapy. Always research the plant part and production method used. Sometimes you might find several different options for one plant, like cinnamon leaf and cinnamon bark or dry ginger and fresh ginger. These will offer very different properties and aromas to your creation. Find out more about Citrus aruantium oils in this blog. Purchase small amounts to start. One drop of essential oil goes a very long way, so a 1/2 oz. or 1 oz. bottle will last quite a while! Plus, essential oils can be pricey, so it's nice to experiment and discover which ones you use most often before purchasing large amounts. Dark colored glass, like amber bottles, is the way to go. Store your essential oils in a cool, dark cabinet away from heat and light. Don’t store with the glass and rubber-top dropper in the bottle! Essential oils are concentrated and can break down the rubber over time. Always remove the glass dropper and use the screw cap. The drop-by-drop reducers that come in small bottles are fine and do not need to be removed. Learn more storage tips here! #5: Are essential oils safe? Well...yes and no. We like to say that less is best and use with care! These highly concentrated aromatics enter through our olfactory system and the skin, leading directly to the brain and our bloodstream. This allows the plant properties to cause changes both emotionally and physiologically within our bodies. Yes, but, essential oils also have to be detoxed by our liver and kidneys, and some plant aromatics are hard to process. Even using larger amounts of "safe" essential oils can be harmful to certain populations like children, people with compromised liver or kidney health, animals, and pregnant women. We highly recommend seeking the guidance of a qualified healthcare practitioner in these cases. #6: What's a safe way to use essential oils topically? All that said, there are endless ways to use essential oils topically. 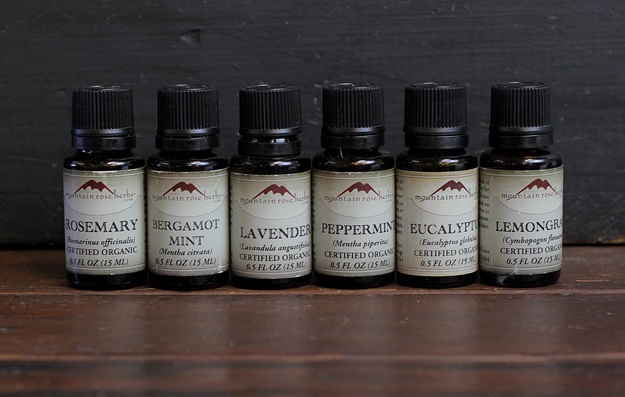 You should always dilute essential oils with a carrier of some kind. This can be organic vegetable oil, hydrosol, witch hazel extract, or alcohol. Any time you are working with a new essential oil and want to make a skin care recipe, do a patch test to make sure you won't have a reaction and the oil is right for you. Always avoid mucous membranes like the eyes and mouth unless you are under the care of a practitioner. These oils can be very caustic and can cause serious chemical burns! Research the oil’s properties before use to make sure it isn't contraindicated for your health. 1% Dilution: 5-6 drops per ounce of carrier is appropriate for preparations such as massage, where a lot of product is being used on the skin. 2% Dilution: 10-12 drops per ounce of carrier is appropriate for aromatherapy applications and body care recipes. Learn more about dilutions here! #7: Should I use essential oils internally? There is so much misinformation out there about whether or not essential oils are safe to use internally! Along with the international aromatherapy community, we say that you should never use essential oils internally without the guidance of a qualified healthcare practitioner. While there are some essential oils that can be used safely, this is the safer path to take, especially without skilled supervision. Essential oils can be incredibly caustic, causing burns or irritating the mucous lining of your digestive tract. Herbal preparations are more appropriate if you are wanting to take aromatics internally. One cup of peppermint tea or fresh squeezed lemon juice are strong remedies. Herbal preparations are very effective when used as gentle support for your body's own natural healing processes. More and stronger is not always better or more helpful. Remember, aromatics must be detoxed by the liver and kidneys. If you are looking for something a bit more potent than tea, tinctures are a great option for internal use - not essential oils. #8: What kind of recipes can I make using essential oils? Essential oils can be used in so many different ways! From natural body care formulas, to diffusing for aromatherapy and inhalations, natural perfumery and body sprays, massage oils, cleaning products, and much more, these versatile plant ingredients offer many possibilities. EXPLORE OUR FAVORITE AROMATHERAPY BOOKS!